During 1948, The War Office of Britain gave official orders for the squatters at the camps of Old and New Dechmont to be cleared out, to make way for their proposed Territorial Army Firing Range. The area was proposed to be flattened of any makeshift dwellings, fenced off with warning signs and to be used as an army practice training ground, with no access to residents of Blantyre. The plans were of much concern as 57 families lived and squatted in the ramshackle buildings of the camps. Nearly all men in the camps were ex serviceman, their families having come into hardship during the war years. Thankfully, the Department of Health were at hand for several months before the eviction and made some excellent provisions in readiness. 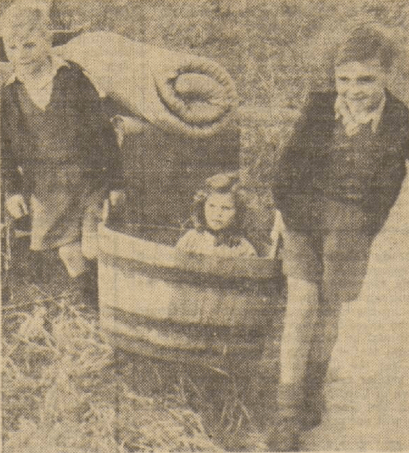 When the eviction order commenced at 6am on Friday 8th October 1948, the Department of Health ensured it would be free for the 57 families, picking up any costs. They provided huge removal vans and assisted the 57 families moving their entire possessions and incredibly were complete by the next evening. You may already be thinking this is shaping up to be a sad tale, but there is a happy ending to the story. In the previous months, the Department of Health had sourced a suitable new location for the 57 families, with a specific remit of keeping them all together, and ensuring wherever they moved to would be local and with better conditions that they had been used to. The Department kept it’s promise and 3 months before the eviction sourced an old army camp at Blantyre Ferme. The buildings were run down, but considerable monies were spent, upgrading them to a high standard. And what a standard that was! The huts were thoroughly overhauled by plumbers, electricians and joiners and converted, sometimes joined together into 2, 3 and 4 apartments. Water and electricity was provided in each home, along with flushing toilets and wash-houses. The 57 families were each overjoyed at being given such accommodation. Of course, this wasn’t entirely free afterwards. Having paid no rent at Dechmont for poor living conditions, the new lodgings at Blantyreferme were almost palatial. All 57 families were satisfied to begin paying a heavily discounted rent for their new living arrangements. 3 shillings a week for a room and kitchen, or 7 shillings for 3 rooms and a kitchen. 2 shillings per week was the charge for electricity which at first was on temporary generators, only until the connection was made shortly after. Women at Blantyreferme didn’t need to queue for rations, as food and fuel delivery shopping vans were frequent to the camp. A special bus was put on permanently to take the children to school and back, direct to the gates of the camp. You can imagine the excitement of the flit and being able to choose who you were going to live beside! In the above photo, 3 year old Ann Taylor isnt going for a bath. She’s simply stealing a ride with her friends James (9) and Benny (7) Craig as they help unload furniture at their new Blantyreferme home. At the old Dechmont camps, there was no water or electricity. Nor washhouses. Water was fetched from wells, often a distance away. The conditions were cramped, squalid and fearsome. The delight on the families who moved was evident. Mrs Emily Scott and her 3 children Coral (12), Emily (4) and David (2) soon settled down in their new home quoting “this is far better than my last one! I feel i’ll be quite happy here and be close to all my neighbours“. 40 year old John Croll, the camp caretaker told journalists at the time, “i gave up my room and kitchen in Corn Street, Glasgow to come here. I’ve no regrets and it’s up to everyone here to make this the showcamp of Scotland“.